The gentleman’s sport, cricket, has never really managed to gain the same international glory of football or other team sports. Out of all the countries in the world, only 12 play this sport. And, in all of them, the sport is hugely celebrated, while the cricketers are worshipped by the people. Over the years, cricket has changed a lot in terms of format, tournament, and much more. Cricket has become faster, more exciting for the young crowd, and also became one of the highest paying sports in the world. The cricketers have enormous opportunities to earn well from the international and league tournaments, as well as from their sponsors. Let’s take a look at the top 10 highest paid cricketers of 2019! This list is about the highest paid cricket players in the world right now. All the players enlisted here are currently active in the domestic and international cricket. While making this list, we mostly concentrated on the national team salary and domestic/franchise team salary. Besides knowing about the highest paid, you can also check our richest cricketers of all-time list. No one can deny the contribution of this 37-year-old batsman in the rise of the Indian team after 2002. Considered as one of the best hard-hitters of cricket, Yuvraj Singh created a buzz in the media after scoring 6 sixers of 6 balls. Besides, he played a crucial role in India’s 2011 World Cup and 2007 T20 World Cup victory. He also earned praises for his glorious comeback after battling with cancer. BCCI recently ripped off the central contract of Yuvraj Singh. Besides, Kings XI Punjab bought him for just 2 crores INR in the last IPL auction. However, he will play for the Mumbai Indians in IPL 2019. He has earned nearly $3.5 million this year, majorly due to his endorsement contracts. Yuvi is currently associated with brands like Puma, Sports365, Ulysse Nardin, Xbox 306, and Codemasters. He also has his signature apparel brand called ‘YWC by Yuvraj Singh’. The former Australian captain holds the ninth spot in the list of the highest paid cricketers in 2019. The World Cup-winning Aussie has earned praises for being one of the best Australian athletes during his heydays. He helped the ‘Baggy Greens’ to secure the ICC Cricket World Cup in 2015. Shortly after, he announced his retirement from the international circuit. However, he played for several domestic teams such as the Pune Warriors and Sydney Thunder. After his retirement from active sports circuit, Michael Clarke made his name as a commentator and cricket analyst. He has made nearly $3.9 million this year through several of his sponsorship deals. Besides, he also earns quite a good amount of money as a cricket pundit for several sports channels. Clarke is currently associated with global brands such as GlobalTech, Hublot, and the Art of Fusion. His wife, Kyly Clarke, is also a successful businessman and currently owns brands like Lyfestyled. The 37-year-old Indian batsman currently holds the eighth place in the list of highest paid cricketers in 2019. After playing his last Ranji Trophy match for Delhi against Andhra, Gautam Gambhir announced his retirement from all forms of cricket recently on 3rd December 2018. Often dubbed as the finest openers of cricket, Gambhir displayed his captaincy skills for Kolkata Knight Riders in the IPL. IPL franchise Delhi Capitals paid him just $0.41 million to get him on their squad in 2018. However, he became successful to earn nearly $4.79 million this year, mostly due to his endorsement deals. His current sponsorship portfolio includes brands like Rudra Buildwell Realty, HR Infracity, Pinnacle Speciality Vehicles, and IJPL Talent Hunt. Besides, his wife Natasha Jain also belongs to a prominent business family. 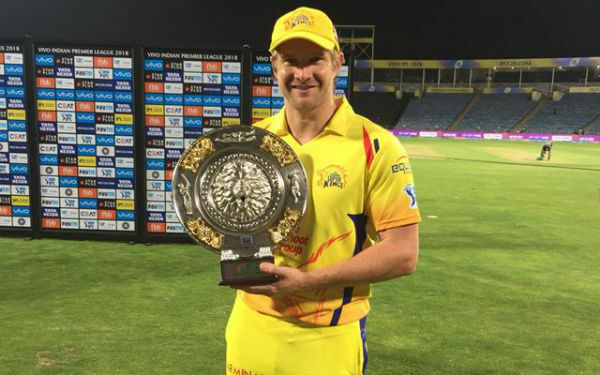 One of the Best All Rounders of all time, Shane Watson, helped Chennai Super Kings to win the IPL 2018. And, this legendary cricketer also holds the seventh place in the list of highest paid cricketers in 2019 with a total income of nearly $5.5 million. The former Aussie captain is currently associated with several reputed brands such as Platinum Speakers, SG, Beon Global, and Cricket Australia. Besides, he also owns a sports clinic called ‘Let’s Activate’. Shane Watson has earned $0.59 million in 2019 through his contract with the IPL franchise Chennai Super Kings. He earned $0.15 million through PSL side Quetta Gladiators. Besides, he also earned $0.5 million from Big Bash club Sydney Thunder. Moreover, the former Australian captain has made nearly $4.26 million from several of his endorsements this year. Apart from cricket, Watson also writes sports columns quite frequently for several media houses. Known for his fastest ODI centuries and some of the biggest sixers the world has ever witnessed, Shahid Afridi remains as one of the most prominent Pakistani figures in world cricket. Often dubbed as “Lala”, the cricket world also knows him as ‘Boom Boom’ for his hard-hitting batting style. He recently announced his retirement from the international circuit after playing his last game for the World XI against West Indies on 31st May 2018. Shahid Afridi currently plays for the PSL side Karachi Kings and BPL franchise Dhaka Dynamites. He has also earned quite a good amount of money while playing for the Paktia Panthers in the inaugural season of the Afghanistan Premier League. However, his endorsements contributed nearly $5.42 million this year thus making him the sixth highest paid cricketers in 2019. Afridi currently runs the ‘Shahid Afridi Foundation’ to support several humanitarian causes. WHAT A DAY ! World Cup 2011. 8 years ago on this day, we lived a dream and the whole nation celebrated. One of the greatest batsmen of all time, Virender Sehwag, has earned his reputation for scoring some of the best batting innings during his heydays. And with his income of $6.1 million this year, he holds the fifth place in the list of highest paid cricketers in 2019. Often dubbed as the most outrageous sportsman on Twitter, Sehwag frequently makes a headline for his controversial comments. Besides cricket, he now also works as a guest commentator for India’s matches. Sehwag last coached the IPL franchise Kings XI Punjab and bagged nearly 1 crore INR as his salary in the 2018-19 season. But, most of his earning this year came from his endorsement contracts. His sponsorship portfolio is now fueled by big brands such as Adidas, JK Cement, Boost, Hero, Royal Challenge, and Rasna. Besides, he also runs his own ‘Sehwag International School’ since 2011. Unbelievably talented AB de Villiers is known as one of the best cricketing talents ever produced in South Africa. And with a total income of $6.4 million this year, he holds the fourth place in the list of highest paid cricketers in 2019. He shocked the cricketing world last year after he declared his sudden retirement from international cricket right after the IPL 2018. Pakistan Super League recently announced that he will be a part of the fourth edition of PSL in 2019. Besides earning nearly $1.6 million from his contract with IPL franchise Royal Challengers Bangalore, AB de Villiers also earned nearly $0.8 million through his central contract with the South African cricket board. But, around $4 million came through his endorsement deals this year. The sponsorship portfolio of Mr. 360 includes global brands such as MRF, Audi, Puma, Montblanc, Supersport, and Aca Joe. One of the best T20 batsmen of all time, Chris Gayle, currently holds the third place in the list of highest paid cricketers in 2019. He is not a regular part of the West Indian national team but primarily earns his bucks while playing T20 leagues all over the globe. Gayle is the only player to score more than 10,000 T20 runs while playing for several domestic leagues; no doubt he is still a gem for his franchise teams. IPL franchise Kings XI Punjab got Chris Gayle on their side for a base price of 2 crores INR. Besides, he also earns a huge chunk of money while playing for PSL franchise Multan Sultans, APL side Balkh Legends, and Mzansi Super League club Jozi Stars. But, most of his earnings came from his huge list of endorsements. The current sponsorship portfolio of Chris Gayle includes Spartan Sports, Agrani Homes, Attitude, and betterU. Besides, he also established ‘The Chris Gayle Academy’ in 2015. There is no comparison between the top two and the rest eight of the highest paid cricketers in 2019 as the second place holder, MS Dhoni, earns nearly three times of the third place achiever Chris Gayle. He is still the only cricketer ever to rank under 25 in the Forbes List of top-100 highest-paid athletes in 2014. But after his retirement from the international test cricket, his brand value has gone down significantly. BCCI recently offered MS Dhoni an ‘A category’ annual contract which will earn him more than 5 crores INR this year. Besides, he also bags around 15 crores salary from his current IPL franchise Chennai Super Kings. One of the greatest wicketkeeper-batsman of all time, Dhoni, earns most of his income from his endorsement deals. His sponsorship portfolio now includes brands like PepsiCo, Reebok, Exide, TVS, GE Money, Dabur, Exide, Lava, and Dream11. The Indian skipper is the only cricketer to be featured in this year’s Forbes list of highest paid athletes. And with a total income of more than $24 million this year, he tops the list of highest paid cricketers in 2019. Often dubbed as one of the greatest cricketers of all time, Kohli, is also one of the most marketable athletes of this year. He is also the only active cricketer to have more than 25 million Twitter followers. Virat Kohli recently signed an ‘A+ Category’ central contract with BCCI which will earn him more than $1 million this year. Besides, he also signed an improved contract with the IPL side Royal Challengers Bangalore for an astonishing annual salary of $2.6 million. But, most of his earnings generate from his never-ending list of endorsements. His current sponsorship portfolio includes global brands like PepsiCo, Puma, Audi, Tissot, Uber, Oakley, Herbalife, Colgate-Palmolive, and New Era. The values of the annual incomes of the players are mostly approximate, especially the top three. Their exact contract amounts with the teams and the brands they represent are not revealed by either party, and there’s a high possibility that Kohli earns more than the others. In any case, based on the official records and best speculations, you now know the highest paid cricketers’ list!